After a week of less-than-perfect diet, I wanted something that was hearty and filling, but without the heaviness of meat. It was time for some vegan chili. Chili is one of those dishes that means different things to different people. Some have strict rules around whether or not beans are included and what can and can’t go in or on a chili. The spice level can also vary considerably. No matter how you make it chili is downright delicious. The chili is chunky and the flavours are wonderful. There is a little heat from the spices, but it’s easy to ramp according to your preferences. Scott always puts hot sauce on everything (just like how I put cheese on everything). Of course, he hasn’t quite learned how to pour slowly and his face was red in no time. 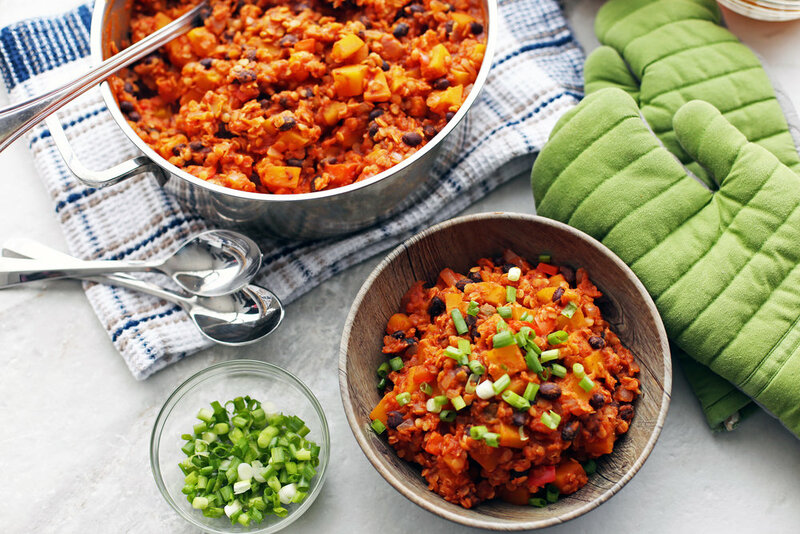 When picking out the vegetables for this vegan chili, I had an unexplained desire to experiment with red lentils. Maybe it was because we don’t eat a lot of lentils in our house, but I felt they would be right at home in this dish. I’m glad I followed my instinct on this one because the lentils really fill out the bowl, making it nice and chunky. Plus, red lentils are full of fibre, iron, and protein. 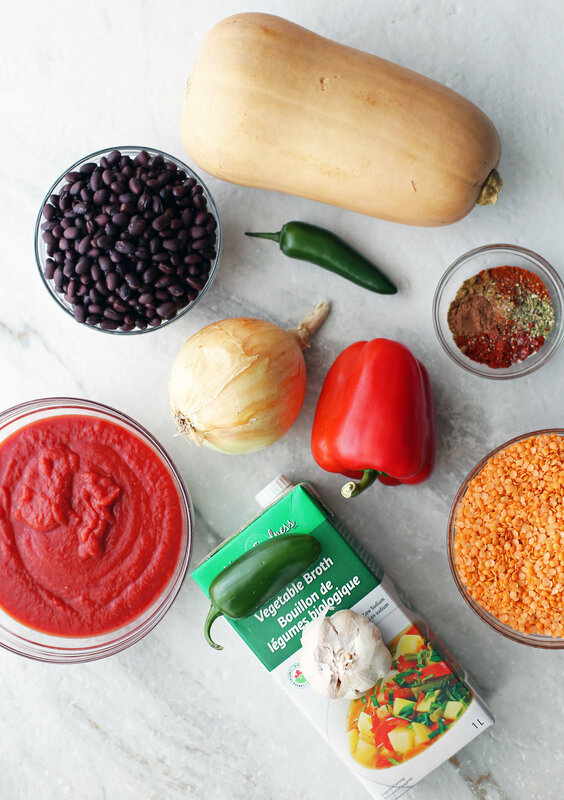 Together with the black beans, this recipe has no shortage of fibre. 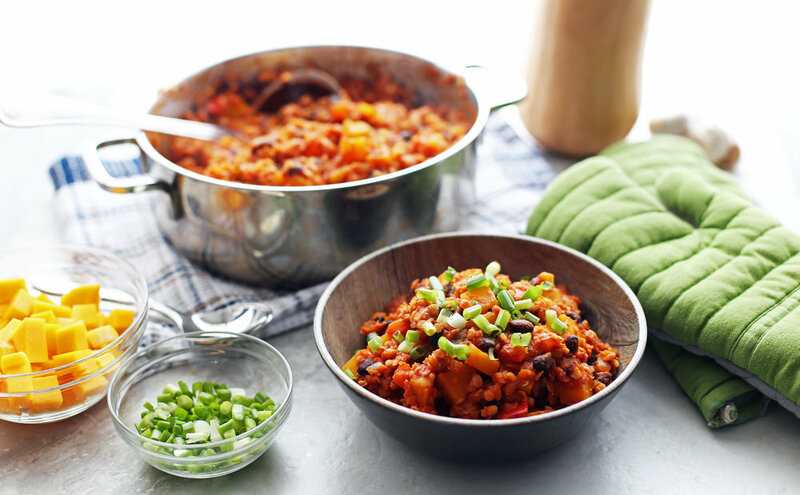 Butternut squash brings that sweet and nutty flavour to balance out the acidity of the tomato while also adding bulk to the chili. It brings it’s own health benefits as well, being a good source of fibre, potassium, and vitamins C, A, and E.
All the ingredients gathered together. Exact amounts listed below in the "ingredients" list. All the vegetables are chopped and diced up and ready to be cooked up into a yummy meatless chili. The peppers and onions are sautéed with olive oil before the spices and garlic are stirred in. It smells so fragrant! Then all the other ingredients are added, brought to a boil and then simmered for 25-30 minutes. When you add it all up, you get a healthy and hearty one-pot meal that you can make ahead of time and keep for days or freeze for months. Perfect for bring some warmth to those crisp autumn days and cold winter evenings. 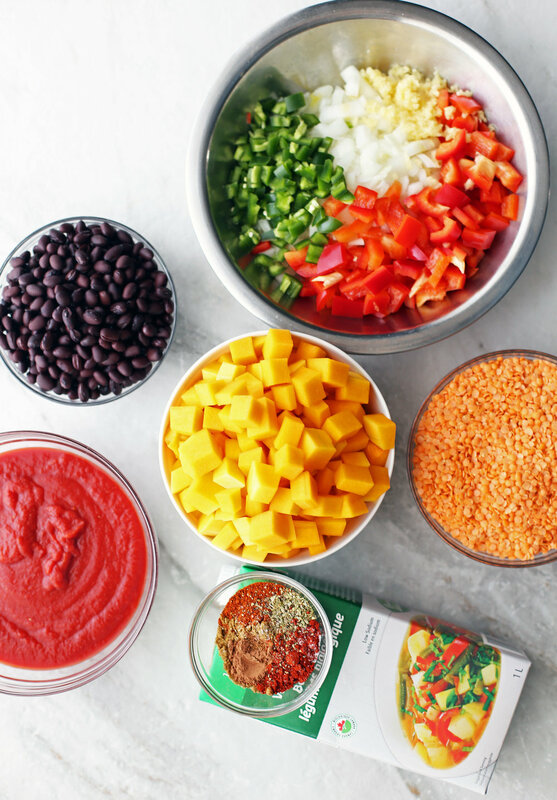 Bowl up as much chili as you want and then top the chili with toppings of your choice. I added green onions and after the pictures were taken, I added some feta cheese too. What do you like to add? I hope you enjoy this recipe! Let me know if you make it with a comment down below or through my social media. 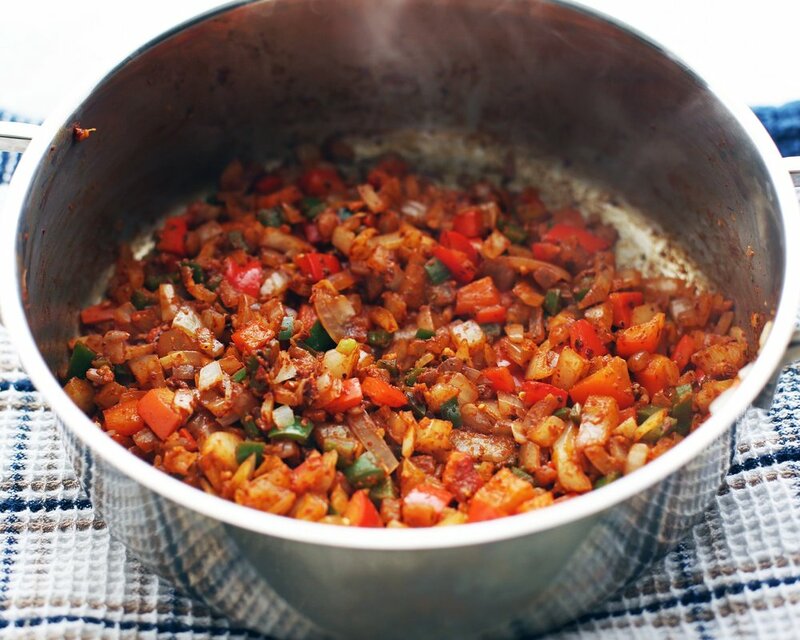 Using a large pot on medium-high heat, add olive oil and saute the onion, bell pepper, and jalapeno, stirring frequently, until the onions are translucent and the peppers begin to soften (about 3-4 minutes). Then stir in the garlic and chili seasoning, allowing the spices become to become fragrant (about 1-2 minutes). Add the red lentil, butternut squash, black beans, crushed tomatoes, and vegetable broth and stir until well-combined. Bring the chili to a boil and then reduce the heat to a simmer. Cover and let it simmer for 25-30 minutes, until the butternut squash and lentils are tender and cooked through. Top with optional ingredients of your choice. Best served warm. Makes about 12 cups of chili. Store cooled leftovers in an airtight container for up to 4 days in the refrigerator. Re-heat on the stove-top or microwave. When keeping for longer than 4 days, place the leftovers in an airtight container or freezer bag (with air-pressed out) and store in the freezer for up to 4 months. Let the frozen chili thaw overnight in the refrigerator before reheating on the stove (add a shallow layer of water to prevent the chili from scorching the pot) or heat it up in the microwave.